Lightly feathered layers and body frame the face on this pretty, chin-length bob. 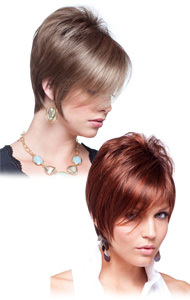 Janet by Wig Pro is made of 100% Remy human hair, offering a monofilament top and a machine made cap. 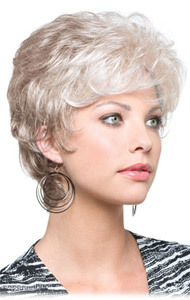 Elegant and easy, this wig is designed to allow for various styling options. Smooth layers with extra length at the nape make a contemporary profile. • Crown: 4.25 - 6 in. Jax features an edgy, tapered cut with wispy, asymmetric fringe and face-framing points. A free-spirited mix of textured curls that can be tamed or tousled. The Aero-Light Cap offers extra comfort and breathability. A modern bob perfectly layered with texture and volume.